Celebrity Gossip and Entertainment News: Ronan Farrow Not Actually Blue Eyed. 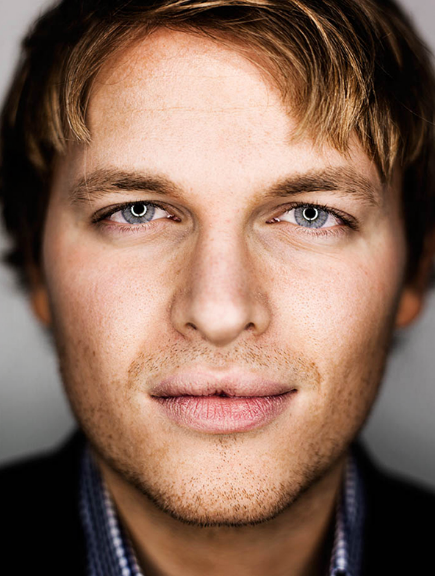 Ronan Farrow Not Actually Blue Eyed. Mia Farrow's famously blue-eyed son Ronan busted wearing blue contact lenses. The son of Mia Farrow and possibly “Ol’ Blue Eyes” Frank Sinatra wears colored contact lenses to make his eyes a brighter blue, sources confirmed to Page Six. The MSNBC host landed his show soon after Mia claimed that Sinatra, and not Woody Allen, could be Ronan’s father, sparking a debate about whether he shares the legendary singer’s piercing eyes. But Ronan was spotted fueling the speculation by wearing contacts to make his eyes appear Sinatra blue during the Time 100 Gala Tuesday at Jazz at Lincoln Center. “You could see the outline of his contacts,” said a spy. His eyes are blue...the contacts make them a lighter blue.